J. R. Carpenter is a Canadian artist, writer, performer, and researcher based in Plymouth, UK. She was born in Nova Scotia, Canada, in 1972, and lived in Montreal, Canada, from 1990 - 2009. She has been using the Internet as a medium for the creation and dissemination of experimental texts since 1993. Her work has been presented at museums, galleries, conferences, and festivals around the world and is included in The Rhizome ArtBase, the Electronic Literature Collection Volumes One, Two, and Three, and the ELMCIP Anthology of European Electronic Literature. 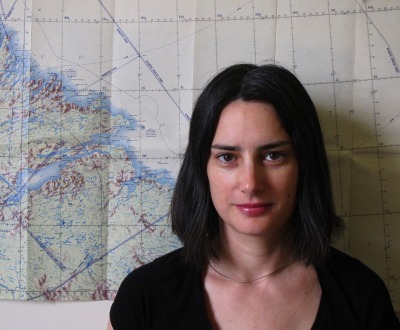 Her web-based work, The Gathering Cloud (2016) won the New Media Writing Prize, and was was short-listed for the Robert Coover Prize for a Work of Electronic Literature. A book by the same name was published by Uniformbooks in 2017. Her web-app This is a Picture of Wind (2018) won the Dot Award for Digital Literature and the Opening Up Digital Fiction People's Choice Award, and was shortlisted for for the Robert Coover Prize for a Work of Electronic Literature and New Media Writing Prize. Her essays, art reviews, poetry and short fiction have been broadcast on CBC Radio, translated into French, Italian, German, and Spanish, and published in numerous journals and anthologies. She is a winner of the CBC Quebec Short Story Competition (2003 & 2005), the QWF Carte Blanche Quebec Award (2008), and the Expozine Alternative Press Award for Best English Book for her first novel, Words the Dog Knows (2008). Her debut poetry collection An Ocean of Static was Highly Commended for the Forward Prizes (2018). Carpenter has been awarded research and creation grants in literature and new media from the Conseil des Arts de Montreal, Conseil des arts et des lettres du Quebec and Canada Council for the Arts. She is a fellow of Yaddo, Ucross, Caldera, Struts, The Banff Centre, and The Vermont Studio Center. She was E-Writer-in-Residence in the Performance Writing area at Dartington College of Art (UK) in 2009. She served as President of the Board of Directors of OBORO, an artist-run gallery and new media lab in Montreal, from 2006-2011. She served on the faculty for In(ter)ventions: Literary Practice at the Edge at The Banff Centre 2011-2014. She served on the Scientific Committee of Labex Arts-H2H at University of Paris 8, Paris, France 2016-2018.